From the 1946 movie adaptation starring Lana Turner in her first screen role, to the steamy remake with Jack Nicholson and Jessica Lange scrabbling passionately on top of the kitchen work surfaces, it’s easy to forget that these came from a great short noir book published back in 1934. 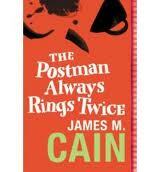 I just spent some time today rediscovering the smart, spare and deadly deeds of the James M. Cain novel, which rattles along and it’s clear to see why his work translated so well to screen for this, Double Indemnity and Mildred Pierce. The copy I read was from Orion and features a really nice intro by James Lee Burke on his own discovery of Cain’s writing. You can order it here. Go on, go take a little journey to the dark side of life – see where passion takes you.